Detroit is based on real events from 1967. It’s important to remember that when watching this, as, given current world events, it could just as easily pertain to several more recent incidents. 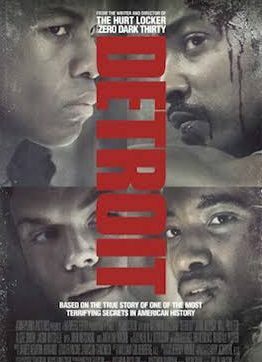 It tells the story of the Algiers Motel Incident, which occurred during Detroit’s 12th Street Riot. If you’re not familiar with the story, in July 1967, three young black men were shot dead by Detroit Police Officers in the Algiers Hotel. The men were unarmed, and had committed no crime, and the officers in question were later tried for their murder. Bigelow splits this into three very definite acts – the background to the actual riots, the incident itself, and the aftermath. She spends the most time exploring what actually happened there that night. Parts of this are dramatised, as there are no actual accounts. Several of the people who were held there that night are still alive, and one of the women who was there acted as a consultant on the film, so it’s safe to say that this is a pretty accurate account. This makes it all the more disturbing as, much like Christopher Nolan’s war epic, Dunkirk, Bigelow goes for an immersive feel in this part of the movie, and it is not always an easy watch. You really get a sense of the sheer terror felt by the people who were rounded up that night. This is in no small part thanks to Poulter as a trigger happy cop. He is truly sinister in the role. Algee Smith, as singer Larry Cleveland, also gives a noteworthy and multi-layered performance, that will completely mesmerise you. In fact, all the cast do a great job, but unfortunately, character development suffers in the eagerness to tell the tale, so you learn very little about people’s lives and backgrounds, and what might have brought them to the place they find themselves in. This does detract somewhat from the tale, and even the ‘where are they now’ catch-up at the end doesn’t make up for what feels like a glaring gap in the story. That aside, Bigelow does manage to juggle the multiple storylines and characters well, so what we get is an extremely intense overview of the tragic happenings that night. This is not Bigelow’s finest work, but it is a truly compelling piece of cinema. It will engage and enrage you, and it will certainly open debate and provoke thought. The phrase hard-hitting was invented for movies like this. Be warned though, it is extremely claustrophobic and affecting. Expect to feel shock, anger and despair throughout. Don’t let that put you off though, as this film deserves to be seen, if only to raise the question about how little the world has evolved regarding race issues in 50 years. ← Club GASS for September, ‘Back 2 School’ Night!